The Abbey, of course! But there's lots more to experience on this tiny and densely packed island. 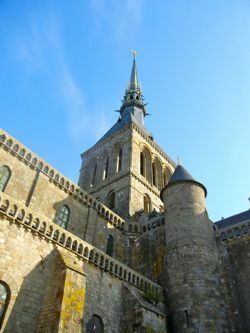 Although most people only spend a few hours at Mont St-Michel, there is lots to see and do, despite its small size. 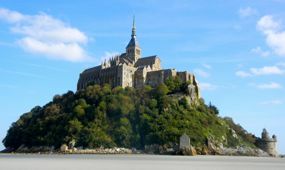 Mont St-Michel will yield many of its charms and its secrets when you explore and photograph, but only if you are prepared. 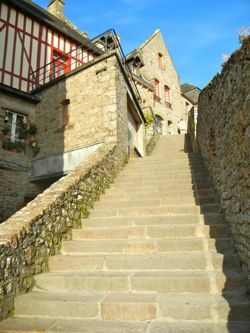 It is full of steep, narrow streets and lots of stairs, both inside the Abbey and outside. You'll need comfortable walking shoes and good knees. Anyone with mobility issues will be challenged here. from the north side, at low tide. That's all sand around it, not water! Saint Michael (St-Michel) on top. lots of stairs at Mont St-Michel!